Lineage. Organized as 34 Aero Squadron on 11 Jun 1917. Demobilized on 10 Jun 1919. Reconstituted, and redesignated 34 Pursuit Squadron, on 24 Mar 1923. Activated on 15 Jul 1931. Redesignated: 34 Attack Squadron on 1 Mar 1935; 34 Bombardment Squadron (Medium) on 17 Oct 1939; 34 Bombardment Squadron, Medium, on 9 Oct 1944. Inactivated on 26 Nov 1945. Redesignated 34 Bombardment Squadron, Light, on 29 Apr 1947. Activated on 19 May 1947. Inactivated on 10 Sep 1948. Redesignated 34 Bombardment Squadron, Light, Night Intruder, on 8 May 1952. Activated on 10 May 1952. Redesignated 34 Bombardment Squadron, Tactical, on 1 Oct 1955. Inactivated on 25 Jun 1958. Redesignated 34 Bombardment Squadron, Heavy, and activated, on 15 Nov 1962. Organized on 1 Feb 1963. Inactivated on 30 Sep 1976. 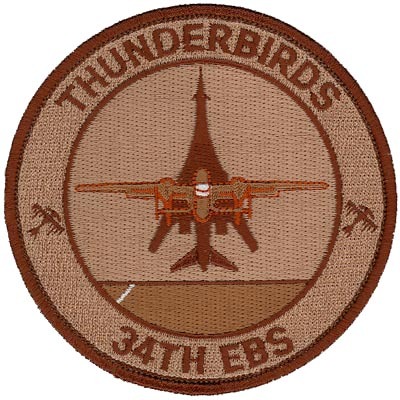 Redesignated 34 Bomb Squadron, and activated, on 1 Jul 1992. Assignments. Unkn, 11 Jun-Dec 1917; Second Aviation Instruction Center, Dec 1917-1919; unkn, 1919-10 Jun 1919. 17 Pursuit (later, 17 Attack; 17 Bombardment) Group, 15 Jul 1931-26 Nov 1945. 17 Bombardment Group, 19 May 1947-10 Sep 1948. 17 Bombardment Group, 10 May 1952-25 Jun 1958. Strategic Air Command, 15 Nov 1962; 17 Bombardment Wing, 1 Feb 1963-30 Sep 1976. 366 Operations Group, 1 Jul 1992; 28 Operations Group, 19 Sep 2002-. Stations. Camp Kelly, TX, 11 Jun-11 Aug 1917; England, 15 Sep-19 Dec 1917; Tours, France, 23 Dec 1917-1919; Mitchel Field, NY, c. 27 May-10 Jun 1919. March Field, CA, 15 Jul 1931; McChord Field, WA, 24 Jun 1940; Pendleton, OR, 29 Jun 1941; Portland, OR, 28 Dec 1941; Pendleton, OR, 13 Jan 1942; Lexington County Aprt, SC, 16 Feb 1942; Barksdale Field, LA, 24 Jun-18 Nov 1942; Telergma, Algeria, 23 Dec 1942; Sedrata, Algeria, c. 13 May 1943; Djedeida, Tunisia, 25 Jun 1943; Villacidro, Sardinia, c. 6 Dec 1943; Poretta, Corsica, 21 Sep 1944; Dijon, France, 20 Nov 1944; Linz, Austria, c. 18 Jun 1945; Horsching, Austria, 8 Jul 1945; Marchtrenk, Austria, 10 Aug 1945; Clastres, France, c. 3 Oct-c. 17 Nov 1945; Camp Myles Standish, MA, 25-26 Nov 1945. Langley Field (later, AFB), VA, 19 May 1947-10 Sep 1948. Pusan AB, Korea, 10 May 1952; Miho AB, Japan, 10 Oct 1954-c. 19 Mar 1955; Eglin AF Aux Field No 9, FL, 1 Apr 1955; RAF Sculthorpe, England, 18 Jan-4 Mar 1958; Eglin AF Aux Field No 9, FL, 4 Mar-25 Jun 1958. Wright-Patterson AFB, OH, 1 Feb 1963; Beale AFB, CA, 30 Sep 1975-30 Sep 1976. Castle AFB, CA, 1 Jul 1992; Ellsworth AFB, SD, 4 Apr 1994; Mountain Home AFB, ID, 1 Apr 1997; Ellsworth AFB, SD, 19 Sep 2002-. Aircraft. P-12, 1931-1934, 1935-1936; P-26, 1934-1935; in addition to A-17 included YA-19 during period 1936-1940; B-18, 1939-1940; B-23, 1940-1941; B-25, 1941-1942; B-26, 1942-1945. B-26, 1952-1956; B-57, 1955-1956; B-66, 1956-1958. B-52, 1963-1976. B-52, 1992-1994; B-1, 1994-. Operations. Ground training unit, 1918. Antisubmarine patrols, 22 Dec 1941-c. Mar 1942. Contributed aircrews for the Apr 1942 Doolittle raid on Tokyo, Japan. Combat in the Mediterranean Theater of Operations (MTO) and European Theater of Operations (ETO), 30 Dec 1942-1 May 1945. German disarmament, Jun-Sep 1945. Combat in Korea, c. 10 May 1952-Jul 1953. Provided crews and aircraft to other SAC units conducting combat operations over Southeast Asia. Beginning in 1994, equipped with B-1B aircraft for conducting long-range strike missions. Deployed for Operation Southern Watch as part of Expeditionary Task Force Southwest Asia (ETFSWA), 1995-1996. Deployed aircraft and aircrews to Diego Garcia, in the Indian Ocean, for planned attacks on terrorist forces in Afghanistan, Sep 2001-Jan 2002. Service Streamers. World War I Theater of Operations. Campaign Streamers. World War II: Antisubmarine, American Theater; Tunisia; Sicily; Naples-Foggia; Anzio; Rome-Arno; Southern France; North Apennines; Rhineland; Central Europe; Air Combat, EAME Theater. Korea: Korea Summer-Fall, 1952; Third Korean Winter; Korea, Summer 1953. Decorations. Distinguished Unit Citations: Italy, 13 Jan 1944; Schweinfurt, Germany, 10 Apr 1945; Korea, 1 Dec 1952-30 Apr 1953. Air Force Outstanding Unit Awards with Combat “V” device: 20 Sep-27 Dec 2001; 1 Jun 2001-31 May 2003. Air Force Outstanding Unit Awards: 1 Jul 1963-31 Mar 1964; 1 Jul 1971-30 Jun 1973; 1 Jan-31 Dec 1975; 29 Jun 1992-28 Feb 1994; 1 Jun 1996-31 May 1998; 1 Jun 1999-31 May 2001; 1 Jun 2003-31 May 2005. French Croix de Guerre with Palm: Apr, May, and Jun 1944. Republic of Korea Presidential Unit Citation: 24 May 1952-31 Mar 1953. Emblem. Approved 18 Jun 1932.